The revival of Reading Rainbow is now one of the top 5 Kickstarter campaigns ever, and to celebrate the other four with that distinction are partnering with RR for special things. And Ouya is one of that select group. First off is new backer rewards that involve that "butterfly-in-the-sky" blue microconsole up there, of which a maximum of 500 will be made, and only as part of the Kickstarter. There's a $250 tier that will get you one of those, hand-signed by Levar Burton himself. If you add $175 to your current pledge, then you also can get one, but not signed. And if you add $150 to your current pledge, one of those will be donated to a school. And if the Reading Rainbow campaign makes it to $5 million then they'll also make a Reading Rainbow app for the Ouya itself in addition to mobile and other consoles. So that's fun. The campaign ends on Wednesday at noon PDT, and they're about $500k short of that particular goal at the moment. 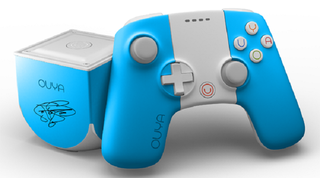 In addition to the Ouya stuff, there are also rewards involving the Pebble Smartwatch, the Pono music thingie and Veronica Mars, and you can read about all that cool stuff here in this campaign update.